When I first saw a photo of crocheted octopi for preemies — a sweet, sleeping preemie cuddled up next to an octopus — I found it irresistible. Yet I wondered: although yarncrafted octopi are absolutely adorable, are they honestly a good idea for preemies? I really wanted a definitive answer before I could even think about recommending this project for readers of Knitting for Charity. I entered “do octopi really help preemies” into a search engine and began to read. The first article I read came from a website called Babble. This article offered quotes from a mother of twin preemie girls, who said she could tell how much the crocheted octopi she had received calmed her daughters. 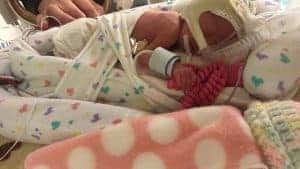 I found another article on Scunthor Telegraph in the UK, where a different woman who had suffered the loss of her premature infant was driven to help other preemies. 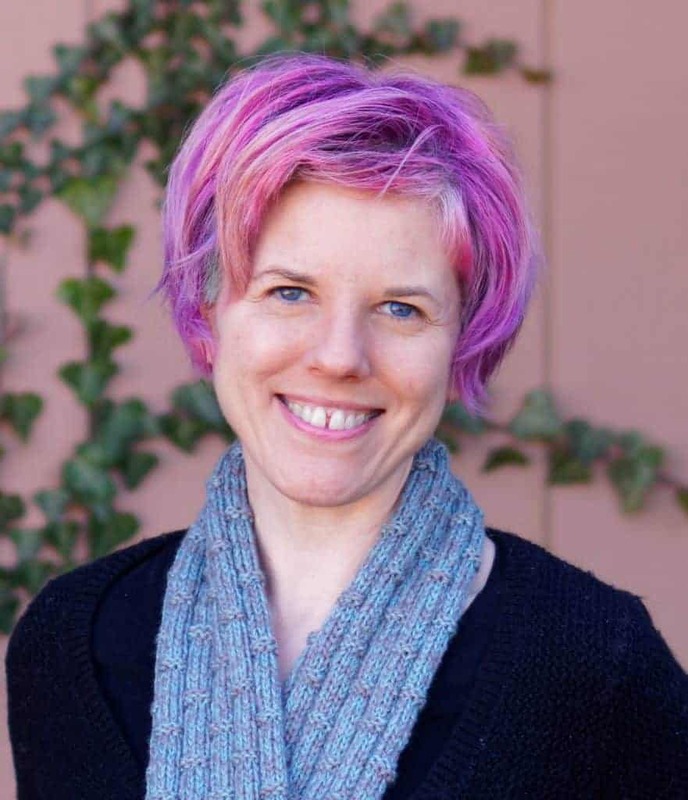 She discovered the crocheted octopus project and decided to begin a similar project in her community. Finally, there’s this article from Essential Baby in Australia. Although it also repeats much of the same information, I loved seeing another preemie with his little octopus. I hadn’t seen baby Noah elsewhere. Why Are Octopi for Preemies Beneficial? After reading these articles, I feel pretty confident that these little crocheted octopi do, in fact, help preemies – as long as they fall within the proper guidelines. Obviously, a too-large octopus would be a problem, as would tentacles that are too thick. The common thread throughout the articles I read: the reason these loveys are beneficial to preemies.The theory is that the tentacles of the octopi resemble the umbilical cord babies grip in utero. Being able to grip umbilical cord-like tentacles appears to produce a calming effect in preemies. Ready to Create Octopi for Preemies? One of the wonderful qualities of most any preemie knitting or crochet project is that you can create them so quickly. Octopi are no exception! You can find the crocheted octopus pattern either on the Danish Octo Project website or on the My Nomad Project website. On the Danish Octo Project site, you can download a PDF for easy access wherever you are. On the other hand, on the My Nomad Project site, you can find a fantastic list of groups all over the world where you can submit your finished octopi! These groups carefully inspect donated octopi to ensure that they are safe for preemies. They then submit the octopi to hospitals in need. Doing this helps ensure that hospitals have just one person to deal with. It also ensures that hospitals receive only safe octopi. **We do have a knitting pattern! It hasn’t been used much since we have far more crocheters than knitters in our group at this time, but we’d love to have more knitters! There are specific guidelines. The yarn must be 100% cotton and the filling must be a hypoallergenic fiber-fill that can be washed at high temperatures (Poly-fill works great). We have a list of approved yarns. But that list is continually growing as people across the country test yarns from their local shops to see how they hold up to the standards. We do request that the pattern listed in our files is followed, but some deviation is accepted. We have fairly strict guidelines, regarding size and stitch size. The stitches must be very tight so no fiber-fill can escape and no tiny fingers can get stuck inside. The sizing guidelines are listed on the pattern as well. The photo with multiple octopuses is from Kendra Thomas and the one with the baby is from crocheter Ashley Gee. The mom is Lindsey Davis and the baby is Lilah Schlappi. Baby is 26 weeks. **Please note: the Octopus for a Preemie knitting pattern is gone for now because the pattern wasn’t producing satisfactory octopi. The US group is working on a pattern that will meet standards. In the meantime, knitters, you can either try to wait patiently (hard, I know!) or else practice your crochet skills! You can join the US group here; remember that you can find groups all over the world here. Two things I love about this project are that it helps to save the lives of tiny babies, and it’s available all over the world. 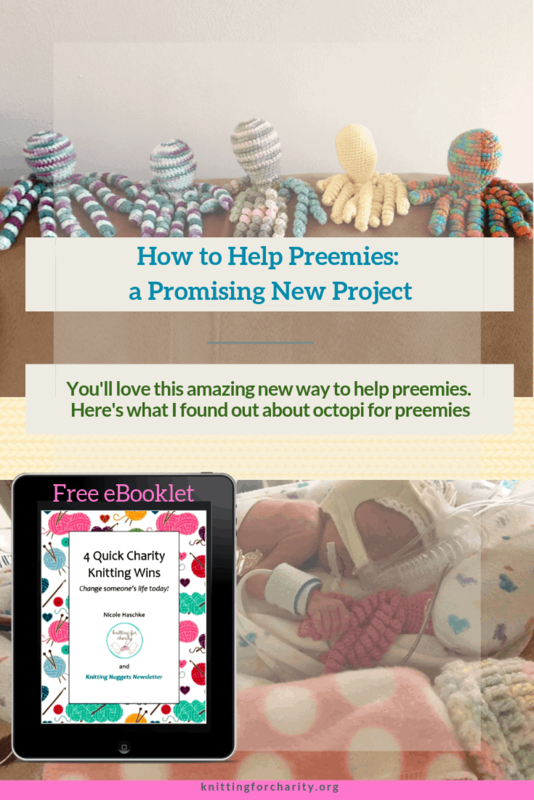 So if you’re ready to help preemies, wherever you are, why not consider making octopi for preemies? Hi, I just wanted to thank you for getting the word out. I hope loads of knitters and crocheters join a facebook group and make octopuses. By the way, the plural of the word is octopuses, even if it sounds weird. Hi Dolores! Thanks for commenting. I hope the Facebook groups have seen an upsurge in interest since this was published. I live in Canada and want to make preemie baby clothes for babies that pass on. I am in BC. Do you know of any that will take these clothes, or is there an organization that I can make them for. Hi Lynn! I don’t know of any charity that specifically takes such items in Canada. However, you might want to check out this organization: The Compassionate Friends of Canada. It’s an organization specifically for bereaved parents. They may be able to point you in the right direction. Good luck! Or they could take it home with them when they go. That way only the one baby touches it. I believe in most of these hospitals the octopus does indeed go home with the baby after s/he leaves the hospital. I couldn’t crochet,to save my life, but I can knit.So where is the pattern please? Iceni, if you are in the U.S. you can join the U.S. Facebook group I linked to above, and you can access the knitting pattern in their files. If you live elsewhere, click here http://mynomadhome.com/the-octopus-for-a-preemie-project-a-list-of-countries-and-their-websites/ and find the group for your country. When you join the group for your country, you’ll be very likely to find the knitting pattern. Thanks for getting back to me so quickly. I am waiting for a reply from the other end of Canada, doesn’t seem to be a group on the Prairies.So will wait and see. There are some hospitals in the prairies however Canada does not yet have an approved knitting pattern as the stitches are hard to get tight enough with knitting. Hi Lori, yes, I would imagine each hospital is different. As I understand it, each Octopus for a Preemie group works with a set number of hospitals, and they invite other hospitals to request octopi as well. I do know that each group has very stringent procedures to ensure that the octopi doesn’t risk the preemies’ health in any way. Thanks for commenting!